Braided Stainless Steel flex lines. Two 20 ft. rolls of 3/16'' stainless steel brake line. Wide assortment of fittings and hardware. Three chassis tabs for chassis mounted brake line. 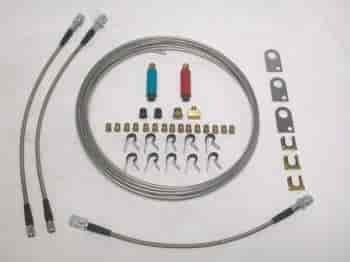 Stainless Steel Brake Systems offer their Brake Line Kits for customers looking to either rebuild and replace their old brake lines and fittings, or the customer that is looking to build a new brake system from front to back. You will need to supply your own fittings that are compatible with your own calipers, but these kits come with all the hard parts that are difficult to find our source for your brake line install.